Growing up, I went strawberry picking. I've written about it here before—it's still an annual ritual, and every year my sister and I go home to pick with my parents in Maine. It's something I want Sally to grow up doing, but so far, I haven't found a pick-your-own strawberry farm on the Cape that recreates the experience. So instead, we're picking blueberries. 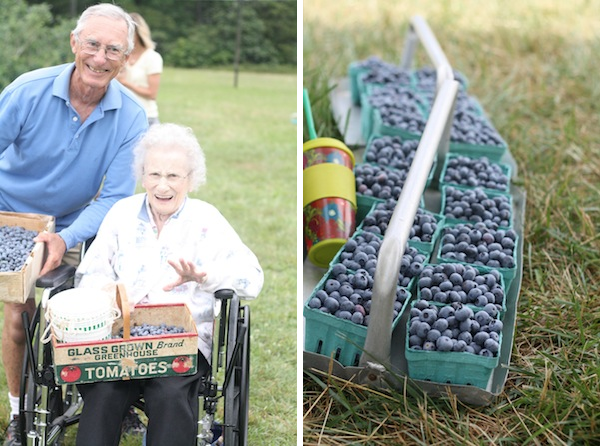 We visited Hokum Rock Blueberry Farm in Dennis for the first time last August, on the last day of the season. We were too late to do any serious picking—the fields were almost picked out, and we each only got a pint. But this year we showed up the first week, and the haul was amazing. I picked 10 pints in half an hour, and we went back this week for more. The thing that struck me most about the morning was how much fun everyone was having. There wasn't a single person in the field who wasn't exclaiming over the size of the berries or how many there were, or sharing their plans for what they were going to do with them. Ninety-six-year-old Marie Pont, up there with her son Ron, put it perfectly. "This," she said, "is heaven." Over the course of the morning, I spoke with all kinds of people—toddlers, parents, grandparents, honeymooners—from all over the East Coast. Here's what they're planning on making. The Blueberry Smash: A cocktail with fresh muddled blueberries, mint, lemon and lime slices, and a generous pour of vodka and St. Germain. Blueberry Pie: I like a traditional recipe, from the Joy of Cooking. But a kid named Joe from Westchester, New York says he and his siblings make blueberry pie with melted marshmallows on top. You use a traditional 9-inch crust, make a regular blueberry pie filling, and then let the marshmallows melt while it bakes to make a kind of meringue. It sounds just like this recipe, except with blueberries. Blueberry Bread: This blueberry-lemon version from Bon Appétit is amazing. Kind of like pound cake, except in loaf form. Blueberry Muffins: This version, with bananas and spelt flour, is a favorite around here. Blueberry Pancakes: Try using this recipe with rye flour and buttermilk for a tangy, lumberjack twist on the original.